Construction site of the Bheri-Babai Diversion Multipurpose Purpose project in this recent picture. 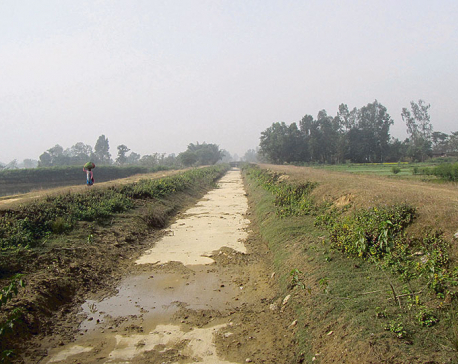 SURKHET, July 24: Construction work on the tunne of the Bheri-Babai Diversion Multipurpose has completed is fifty percent complete, the project office said on Monday. Designated as a national pride projects, it took nine months for the project to bore six of the total 12 kilometers long tunnel. While sharing the update, project officials said that they expect to complete the project on time. 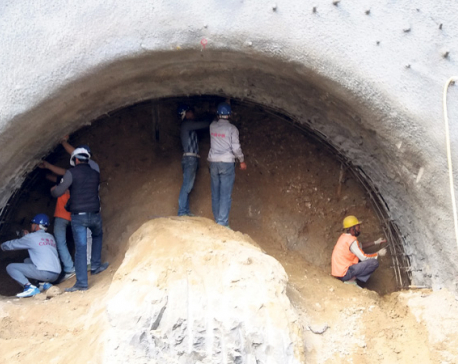 Project Director, Shiva Kumar Basnet, said that with the success in boring half of the tunnel, the project is now expected to meet upcoming deadlines as well. “As the tunnel boring machine was working on a weak geological area, our work had slowed a bit. But the progress made recently has now ensured that we will meet remaining deadlines as well,” he shared. China Overseas Engineering Group (COVEC) has been tasked to complete the mega project by March 2020. Following difficulties in the construction of tunnel with the application of prevailing technology of drill and blast method, the company had decided to use a tunnel boring machine (TBM). This was the first time that TBM is used in boring a tunnel in Nepal and specifically in the Sivalik geological zone. Basnet said that the completed six kilometers tunnel included some of the most risky zones in the tunnel. With the success achieved in boring through the risky zones, he said that they were hopeful of meeting upcoming project deadlines. “At a certain area we were slowed down. Due to the fragile structure of the area, it took three months for the tunnel boring machine to bore around one kilometer of the tunnel. It was important for us to be careful to prevent damage to the tunnel,” he said. The project had kicked off on November 6. Basnet terms the development as highly satisfactory so far. 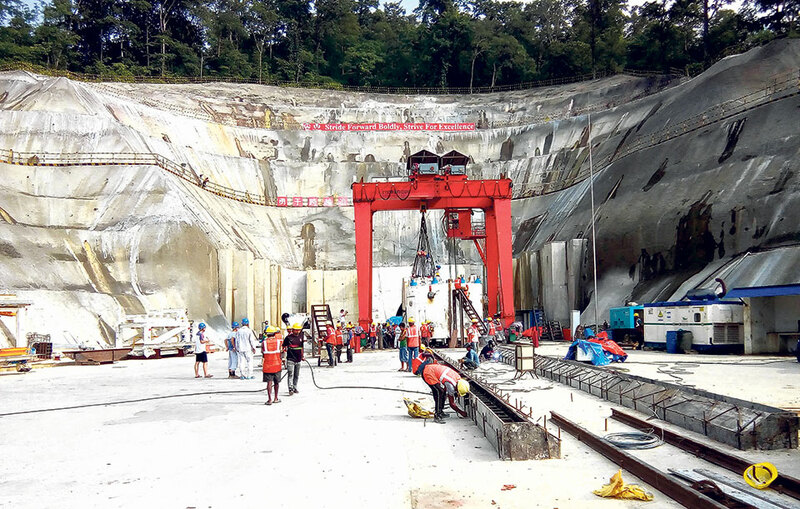 Through the tunnel, water will be channeled from Bheri to Babai River to irrigate 51,000 hectors of land in Banke and Bardiya and generate 48 megawatt of power. 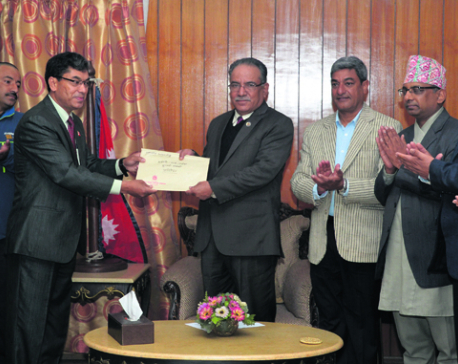 “We are confident that we can meet deadline,” says Basnet. The project procured the TBM from an American company through a Chinese company. Around 500 Nepali laborers and 90 Chinese technicians are working on the project. Chief Minister of Karnali Province, Mahendra Bahadur Shahi , the success achieved in boring the tunnel has given better hope for the development of the province. He said that tunnel boring machines would be used for digging tunnels in other projects as well. “This is a highly ambitious project. We are looking forward for its completion on time. The tunnel is quite essential for the development of our province. Similarly, the machine is ultramodern, which can be used in our other projects too,” he stated. Shahi stated that feasibility study of other developmental projects is underway. For instance, the machine could be used for Bhurigaun - Telpani road block, he noted. “TBM machine is going to make it easy for such projects. There are other projects which we will be announce soon,” he said. Stating that the Karnali is considered the most backward region, Shahi claimed that ‘it will no more be so’. Since the region has immense natural resources, those will be tapped for its development and prosperity, he said. “We are very pleased with the progress of the tunnel. We hope that it will be complete soon. This is just the beginning. We are eager to carry on with many other projects which will change the face of this region,” he said. “We won’t remain a backward region anymore,” he added. According to Shahi, the government’s first priority is the construction of roads and bridges as in difficult geographical terrain it needs proper technical assistance and machines to get the work done. “We are aware that we need a great engineering to make roads here. Or else, it will be a risk than facilities. We have been bearing it now, the roads we have are dangerous,” he said. “Now, we have to correct things and there will be no compromise in the quality of the developmental projects. We have to be sensitive towards the environment and the geographical settings,” he added. In most of the speeches and public hearing, Shahi has reiterated about making Karnali ‘number one province of the country’ in terms of development. “We have the zeal and the vision, we are going to take it to the top,” he said. “Our only goal is the prosperity of our province, he added. Meanwhile, he also maintained that the first right over Bheri - Babai project would be that of the people of Karnali Province.